I think I vaguely recall Jamie Lee Curtis tweeting a picture, around a year ago – on the 31st October most likely – telling the world that a new Halloween movie was on the way. If this blog post was a movie, there’d now be a sequence of dates being ripped from a calendar by an anonymous hand. As it is, you’ll just have to cope with me making the observation that a year flies by pretty fast these days and that on Friday night, me, Jo and her dad took our seats in the Brixton Ritzy in a state of high excitement. You see, there’s something about John Carpenter’s original 1978 movie that gets the juices flowing, even after repeated viewings, in a way that no other film, except maybe – maybe – Jaws can touch. Despite the numerous, mostly bad, sequels. You see, I still remember watching Halloween twenty years ago, not for the first time, with my mum and stepdad and being left on my own downstairs. Within ten minutes of being left, I had convinced myself that Michael Myers – “the boogeyman” was stood outside our front door. Paralysed by fear, it took me some minutes to work out that The Shape at the front door had been created by a combination of papers hanging from the noticeboard and the way the kitchen light was shining on them. Suffice to say, when I did get around to seeing it, it more than lived up to expectations. It still does. So what, then, of David Gordon Green’s Halloween in 2018? Well, it had me at the opening title sequence, the familiar pumpkin inflating, rising from the ashes, as an updated version of that music played. Opening with two, annoying, true crime podcasters travelling to Smith’s Grove Sanitorium in an attempt to interview Michael Myers as the 40th anniversary of the “babysitter murders” (nice nod to the original film’s planned title there) approaches. Failing in their attempt to get a response to their entreaties, podcaster Aaron, reminiscent of Die Hard’s awful TV reporter, tries to goad Michael into a response by brandishing the famous mask. Whilst the mask sends everyone in the sanitorium courtyard a bit mad, Michael is apparently unmoved. The podcaster’s don’t get too much more out of a subsequent visit to Laurie Strode although they do leave her house $3k lighter. But, it won’t be giving much away to say that an attempt to transfer the prisoner goes wrong in a sequence that is a creepy callback, one of several, to the original film. Naturally, it’s not long before Michael is reunited with his mask and on his way back to Haddonfield just in time for Halloween. And what of Laurie? Well, she is isolated from her family. So traumatised by the events of 1978 that she has spent her life preparing for the final confrontation she knows is coming – to the point where her daughter, Karen, was taken by social services as a kid. Their relationship isn’t so good, not to say almost non existent, although Laurie IS trying to build bridges with her granddaughter, Allyson. Clear nods to Terminator 2 here, with the traumatised mother, taken for a paranoid whack job by those around her even donning Sarah Connoresque green vest at one point in the film. I didn’t mind these as I’ve always felt that the purposeful stalk of The Terminator owed more than a little to Halloween anyway. Of course, Laurie – like Sarah Connor – is correct to be worries, just a little, and as Halloween night begins, things start to get nasty, particularly for Allyson and her friends, all leading up to a final, the hunter becomes the hunted, confrontation (but is it really final?) chez Strode. Let’s be clear, here. John Carpenter’s original film, – still! – has the feeling of a noose being inexorably tightened around the neck of both the film’s protagonists and its audience. It also, in several sequences sets up its serial killer as, well, a bit of a tease; a practical joker. There’s not much of that here, despite nods to the ghost train gone terribly, terribly wrong vibe of the original’s climax. Although the John Carpenter’s panaglide tracking shots following Myers are recreated beautifully here, Myers becomes the blunt instrument he chooses to destroy one poor victim. I also felt that the film’s teenagers, though they are given some pretty sharp dialogue, weren’t quite as fleshed out as Annie, Linda and, well, Laurie were in the original film. It’s the way you got to know these girls during the course of a day and night in Haddonfield which made their fates sting all the more. But these are minor quibbles. There have been times during the Halloween franchise when the film makers have been content to trade off the mask and John Carpenter’s music and not bother with much else (though I do think the H20 movie was excellent). This is so much more than that, it’s funny, it’s knowing, it’s made by a group of people who clearly love the original – if you’re reading this, you’ll probably know that John Carpenter has returned as an executive producer alongside Jamie Lee Curtis. And, boy, does Jamie Lee bring it, first simmering with indignation, before engaging her own stalking mode. For his part, alongside his son Cody Carpenter and Daniel Davies, Carpenter senior has created a wonderful, slightly scuzzy, industrial update to his original score. The result of which is a blood pumping climax, and film, which I totally engaged with. 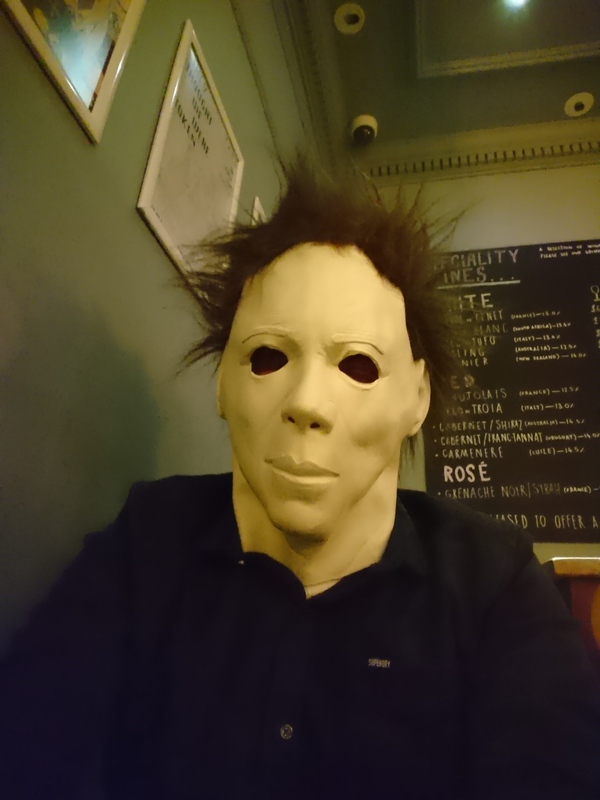 Halloween in 2018 may lack the visceral thrills of its garlanded predecessor, or even a film like Jordan Peele’s Get Out, but I left the cinema, eventually, having had a great time. And what more could anyone ask than that? *Just a note to anyone reading this who went to the 7pm showing in Brixton on Friday night, I’m sorry about the mask, really, but it had to be done. It’s what Michael would have wanted. This entry was posted in Films, Halloween and tagged Halloween, Jamie Lee Curtis, John Carpenter, Laurie Strode. Bookmark the permalink.